Acupuncturists claim to be able to treat a whole range of ailments by strategically inserting needles into various acupoints along the body’s meridian lines in order to control the flow of an invisible life energy known as ch’i or qi, and thus balance the body’s mystical yin and yang. The above quote is taken from a more detailed conclusion that I would recommend reading in full. But it certainly seems from their investigation into the evidence that jabbing the patient outside of the recognised meridians or acupoints or indeed pretending to jab them with either telescopic sham needles, or simply not inserting the needles far enough, has pretty much the same effect as “proper” acupuncture for all treatments other than possibly certain types of pain and nausea. Nevertheless, if the theatrical nature of acupuncture induces a measurable placebo effect then some may argue that there is still a benefit to its usage. However, as more and more healthcare practitioners recognise the importance of honesty with their patients we should perhaps consider more ethical methods of conveying acupuncture. 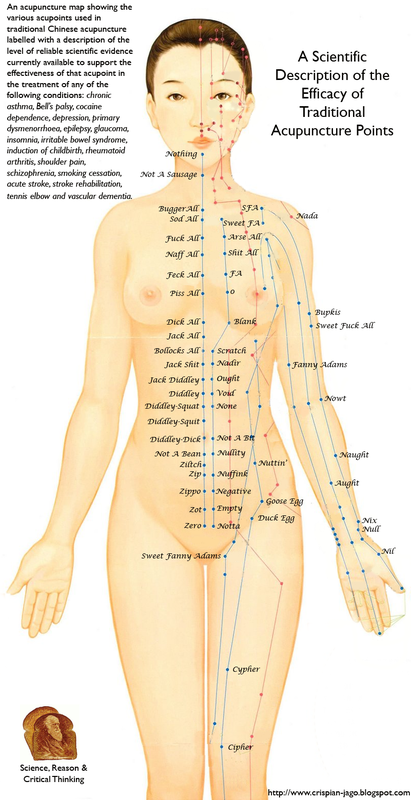 Most acupuncture patients are familiar with the standard acupuncture maps showing the body’s meridians and their various acupoints along those meridians that supposedly have distinct influences on different ailments. 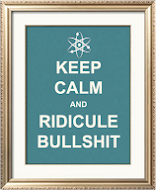 Rather than tall stories of ancient pre-scientific notions of an invisible and undetectable life energy why not simply state the most plausible explanations for any perceived benefit. 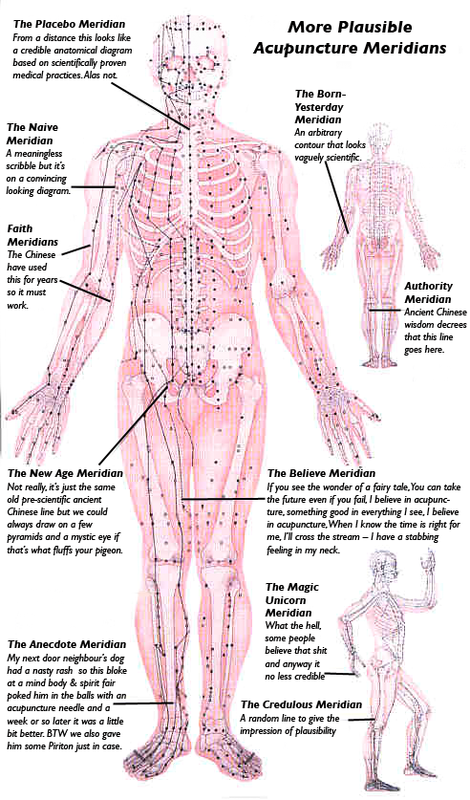 All we actually need to do to achieve this is to simply re-label the meridian lines to describe how they are most likely to work and re-label the acupoints to describe the current unequivocally scientifically proven effect of that particular acupoint. Oh, OK I admit it, it was all just a convoluted way of strategically placing the label "Sweet Fanny Adams" on the anatomical acupuncture chart, but I can never resist a good fanny gag. Wow! I will never again be without a substitute for the word "nothing". "Aught" is "anything", not "nothing". But apart from that...! Please, consider that Complementary therapies are dangerous competitors of BigPharma, which pay and extra-pay many people to diffond only one truth: Chemical. Think the Pope, he spreads ideas much less scientific than meridians... Finally does the truth exist? There is something to be said for qi - it's a very useful word in Scrabble! All the latest research using MRI's confirms that different acupuncture points have an effect on the relevant parts of the brain that control various body functions. You need to do some research further than professor Tweedle Dee and Tweedle Dum. Most anti-alternative researchers claim that studies in these fields are flawed and insufficient but then conveniently ignore studies that show allopathic medicine such as anti-depressants and hormone replacement therapy etc are nor more effective than placebo's, not to mention all the side effects. All this energy spent attacking other healing modalities when it could be put to better use by improving their own..